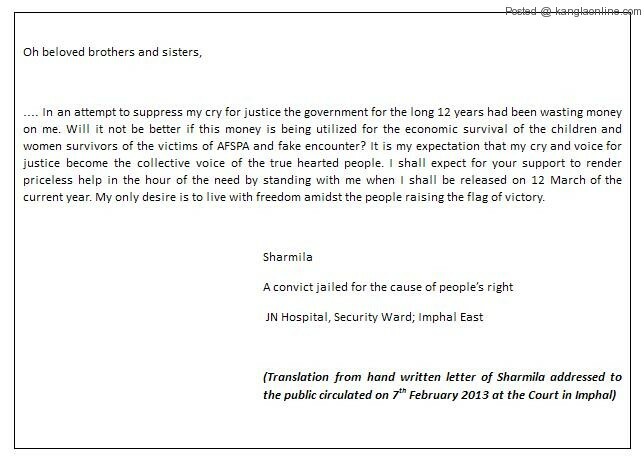 Manipur Students’ Association Delhi is organising a demonstration to render solidarity to Irom Chanu Sharmila who is going to be brought before Patiala Court, New Delhi on 4th March 2013 at 9 am. Manipur Students’ Association Delhi stands for upholding democratic ideals and demands for an end to any form of state instituted injustice and terrorism. MSAD in the past and the present appreciates the heroic struggle of Sharmila as an integral part of the overall movement for peace and democracy. MSAD, therefore appealed you to kindly take part in the demonstration to raise your banner and democratic voice. N.B. :- We are arranging a bus which will be stationed near the Patel Chest bridge, Christian colony,north Delhi at 8:30 am.